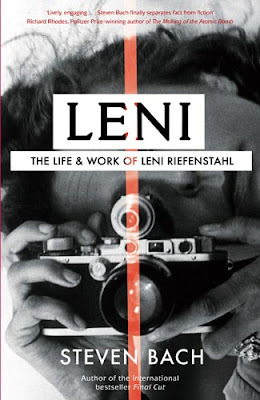 The cover for the UK edition (top) focuses on Riefenstahl's career as filmmaker and photographer (and is yet another entry into the vertically-oriented cover category); the US edition (bottom) makes her look like a mid-century matinee idol. 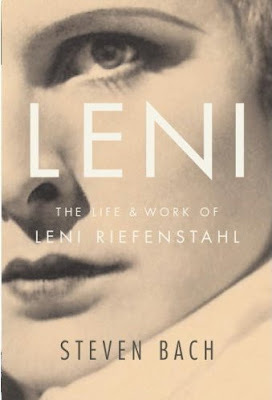 I wish the UK edition let the photo show through a bit more; the title text and white block are a bit too overwhelming. And does anyone have an idea what the red stripe is about? the line might be referencing the split you see when looking through a rangefinder camera. they could have blurred and off-set half the image, but THAT, i think, would have been too much. the red line is the clincher that makes the cover work for me. I would have liked to see the eye that's not covered by the camera. The red line might also suggest a "light leak," much like you might see on film shot through a toy camera. (such as a Holga or Diana). I don't think it's referencing the rangefinder split—but then who knows? yeah, i've never seen a rangefinder focusing line look red like that, but still it signified that to me. the light leak makes sense, too. Light leak makes sense to me, but if you look at it from a purely visual standpoint, it forms a cross with the type. Maybe a subtle suggestion of religion or a social/political statement? I thought the red line might be from an old fashioned light meter inside the camera. My mom had a 1960s canon when I was growing up that had one of those. While it's fun trying to guess what the red line is supposed to be, I think what it really boils down to is adding some color to the cover, which it obviously needed.